Our premises have become tight enough to welcome all interested guests, so for the second year in a row, Purim was celebrated in our Synagogue. It was an opportunity to discus future cooperation with communities from the region. Plans were made for visits to Szeged, Zagreb and Fruska Gora. The New Year of trees and fruits was celebrated in our premises. President of our community Nenad Fogel introduced the guests with the holiday meaning and tradition. The Jewish Community of Zemun hosted the presentation of the Multifaith calendar for 2019 in the edition of the "Mah" club. Professor Marijana Eisenkol, was the promoter of the 20th edition of the calendar. Mirjana Nikolic from the Zemun Tourist Association, gave thanks to valuable activists from Zemun. Among the winners was the JC Zemun. The recognition was received by President Nenad Fogel. In honor of this jubilee, the Jewish Municipality of Zemun has set up an exhibition about the citizens of Serbia who saved the Jews during the Holocaust, but did not receive the Medal of the Righteous by the State of Israel. Our members, their children and friends celebrated Hanuka in the premises of our community. Candles on our chanukia were lit by our youngest, after which they were given gifts. Mrs. Branislava Skoko gave the municipality a stylized menorah, as well as vanilla biscuits for dessert. Mr. Siniša Orolić, the founder of the Organization for Jewish Christian Cooperation, gifted a menorah brought from Jerusalem. He also presented Nenad Fogel and Igor Ginzberg, presidents of JC Zemun and the Federation, with t-shirts printed on the occasion of the seventieth anniversary of the founding of the State of Israel as well as copies of the book Fathers of Zionism by Benzion Netanyahu. Socializing continued with servings from our synagogue. During October, the design, eiting and printing of our new edition, brochure on activities of JO Zemun 2016-2018 (5776-5778) was completed. As well as perennial years, a video release was posted on our YouTube channel JC Zemun. This project was supported by the City Municipality of Zemun with the press service, and the funds were also supplemented thanks to the budget account provided by the Government of Serbia. Members of the Jewish Community of Zemun, together with friends, celebrated the coming 5779-th year. We are particularly proud of the close relationship with our environment. That's why the celebration of the New Year was beautified by Professor Marijana Eisenkol, who read several of her songs. We continued socializing with servings from our Synagogue. In front of the monument raised in memory of our exiled members, this year we gathered together to remember the names of our loved ones. After the laying of wreaths and flowers in front of the monument, the Vice President of the Jewish Community of Zemun Vladimir Mijatović greeted all present and thanked them on arrival. He then read the names of all the victims who were driven away in the carriages to the camps Jasenovac and Stara Gradiška on July 27, 1942. A minute of silence followed in the honor of the victims. On behalf of the City Municipality of Zemun, Damir Kovačević addressed the audience by pointing out the sympathy with the victims and the hope that in the future we will live in the peace and harmony of the multinational community. City Municipality of Zemun report here. The president of Israel and Serbia, Rivlin and Vucic, discovered a street name and a memorial in Zemun, named after Theodor Herzl, an Austro-Hungarian journalist and writer, who entered history as the father of the idea of a modern Israeli state. The reason was that his ancestors, grandfather Simon and grandmother Regina Herzl lived in Zemun and were buried at the Jewish cemetery in Zemun. His family lived in the center of Zemun. The ceremonies were attended by state, city and diplomatic officials, members of the Jewish communities of Serbia, as well as a truly impressive number of citizens and representatives of the media. The delegation of our community was found in a separate section for the officials so that inspite the enormous mass of citizens we managed to attend this ceremonial act from the first lines. The Jewish Community of Zemun held the Regular Annual Assembly for 2018. The Assembly welcomed and wished success in the work of the assistant professor Dr. Haris Dajč, Chairman of the Supervisory Board, formed under the Law on the Elimination of the consequences of the Holocaust. The joint annual report on the work of JO Zemun in 2017, proposed by the members of the Executive Board and the chairmen of all commissions, was unanimously adopted. The report specifically points to the unlawful conduct of the leaders of the Federation in the disposal of funds provided by the Jewish community from the Republic of Serbia. Within the budget, the Assembly adopted the project proposals that we want to implement in 2018, which are envisaged under Article 22 of the Law. All the decisions of the Assembly were made unanimously, which is another confirmation of the strong unity of the members of the JC Zemun. Mladen Mijatovć, a longtime journalist of so-called black column, decided to use his knowledge of the intriguing murder of the café singer Jelena Marjanović into a criminal novel. The former State Security Operater Božidar-Boža Spasić and the author spoke about the novel and the case. Followed they answered questions from the audience. Our community marked the Jom HaShoah Day in the National Musem Zrenjanin by opening an exhibion "The Participation of Jews In The Development of Volunteer Firefighting In Zemun“. Besides the presence of members of the Jewish Municipality of Zrenjanin, we were honoured by the presence of the Secretary of the City Fire Brigade of Zrenjanin and the President of the Fire Brigade of Vojvodina, Mr. Dragan Jajić with his colleague Mr. Rakić. In a speech at the opening of the exhibition, author Nenad Fogel reminded the audience of the suffering of Jews, members of the Matica Fire Brigade, during the Holocaust. Jakov Celebi was the only survivor of all members of Jewish origin. The exhibition features a special film about him and exposed a series of his photographs, documents and personal items, which has been preserved thanks to the long-time member of Matica, Djordje Acimovic. 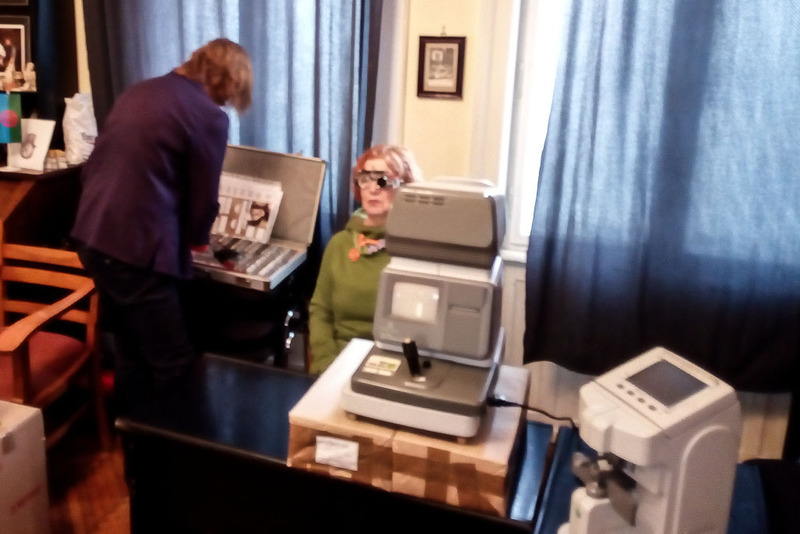 The Social Commission of the JC Zemun, in cooperation with our member Zvonko Galac, organized a free-of-charge oftamological examinations for all members. More than a third of our membership has used the opportunity to examine vision for three days and provide frames and appropriate glasses at discount prices. This is only the first in a series of actions that is being prepared by our agile Social Commission for 2018. New initiatives, which are going to help our membership, are ready for implementation in the second half of the year. Membership will be notified on time for all future actions. This year we decided to celebrate Purim in our synagogue. With a gala dinner, we had the opportunity to feel the spirit of our ancestors who have fought the Austro-Hungarian authorities for years in order to recognize equality with other religious communities. The permission given to build a synagogue (1850) is one of the symbols of our victory in the struggle against the then imperial authorities. President of the JCZ Nenad Fogel welcomed our guests and explained the essence of the holiday. Dejan Popov and his three children Albert, Roza and Ana Maria talked about how the name of the holiday originated. With the beautiful posters they made, the names of the holidays were explained, but they also familiarized the guests with the numerals in the Hebrew alphabet. In the continuation of the gathering, we had the opportunity to host the young musicians Denis Nikicic on the guitar with the vocal accompanying partner. Their jazz music was the right refreshment for guests who have already become accustomed to our classic Jewish repertoire. Later on kosher food from the Sač synagogue was served.